Yesterday’s five New Year resolutions didn’t mention Aussie in France despite the fact that it is now an integral part of my life. After more than two years of blogging I’m still enjoying it as much as ever and never have writers’ block . However, there is no denying that it’s time-consuming even though I’ve become more proficient with regards to the technical side of things. From my original seven posts a week, I cut down to five then to four. I gradually introduced regular features : Sunday’s then Monday’s Photo of the Week/Travel Photos, Wednesday’s Blogger Round-Up, now the Weekly Blogger Round-Up and Friday’s French. I’ve been invited to guest post on several sites : My French Life, Home Exchange, Holidays to Europe, Frugal First Class Travel, Expat Blogs, The Good Life France and Contented Traveller (though the last two are still in the making). I’ve made new friends among other bloggers and have had the great pleasure of meeting some of my readers. I’ve now published nearly 600 posts which has attracted over 8600 comments. Blogging not only satisfies my creative urge, it also makes me appreciate my surroundings more and get more out of everything I do because I know I’ll be able to share my photos and stories. Sometimes I get discouraged and wonder whether it’s worth it. Inevitably I receive a comment or an email from someone I don’t know telling me how much they enjoy my posts and my batteries are recharged. Would you like to see posts on other subjects in particular? Also, how many posts do you have the time or inclination to read each week? Another question that interests me is how you came upon Aussie in France and what made you keep reading it. After a discussion with Leonardo, I have a new feature in the making that I hope will be ready very soon. Thank you for your answers and stay tuned! I most enjoy your photos of Paris and environs and the Friday French lesson. Merci. Thank you, David, for giving your viewpoint. Happy New Year. Rosemary please keep up the blogging. I’m in Australia and living my French life through blogs and yours is one of my favourites. I especially love to hear of everyday things from your life in Paris and Blois – living, renovating, cooking, family, travelling. I found your blog by Googling “living in France blogs”. I’ve been following you for a while but have never commented before – does feel a bit voyeuristic but reading “my” blogs is a happy daily activity. Keep it up please. Merci. Hi Carol and welcome! I don’t consider that it is voyeuristic of you to read without commenting. After all, when we read a book, we don’t comment. Thank you for your feedback. I appreciate it very much. Happy New Year! I read several blogs about France but particularly enjoy yours because you cover a wider range of subjects and pictures than others, including your Friday’s French. As well as enjoying the varied subjects, travels, tips and great pictures I really feel as though I’m learning more about France and French. Have been using your expression “je parle francais comme une vache espagnol” and getting a good laugh each time, plus amused polite protests from French people that no I don’t speak like a Spanish cow. At the book club I attend (where I’ve never used this expression) another member did recently and I’m guessing she must be one of your readers too (will check next time book club resumes after the holidays). Also enjoy your Blogger Roundup as it has introduced me to others I’d never have come across otherwise. Really appreciate your imagination, skills, experience, depth of knowledge and generosity. It’s also so refreshing that you’re not trying to sell products to your readers. So many blogs about France are now doing this. When it’s done occasionally and well I don’t mind but unfortunately some bloggers are getting rather boring, giving fashion tips or whatever and then constantly bombarding readers with encouragements to buy things through links they provide. Surprisingly perhaps, I don’t mind so much if they actually carry advertisements for relevant products/travel experiences on the sidebars, or if they frankly write up a review of a wonderful shop, restaurant or whatever. It’s when they try to induce purchases through “tips” and links in the content that I find it so annoying. Thank you for your lovely comments. I’m so glad that the “Spanish cow” post is so useful! I agree about the advertising. I particularly dislike having an advertisement jump out of you as soon as you connect onto the website. I very occasionally do paid links but only when they fit in seamlessly with the post and my style of writing. Thank you, too, for your other comments and your intereaction on FaceBook. The generosity of your ‘authentic’ life, lived & loved in France, is greatly appreciated for its French/Australian flavours. A delicious, forthright combo! You might be a Sagittarian ?, as an obvious well travelled linguist & educated explorer broadening our horizons with humour & word skills is always on the page! Personally, love interesting content stretching my boundaries to enquire further from comments you make which are never boring or banal. Be different Rosemary, as you are, let’s know what stirs your curiosity about your ‘2’ different living environs, the history in Paris & Blois with photos. Looking back in your experience on being dual as an AU/FR sandwich & how that matters/informs your life today is fascinating for a reader with similar experiences or other such. Honesty over glamour wins everytime. Human interest is what people crave, bringing readers back time & again. The people you meet where you live & travel all have stories to tell, so tell us illustrating with a landscape unique to France/Europe. Not an avalanche of recipes, I beg you, enough already for drowning. Enhance our mind’s eye with the beauty of your perceptions. I agree with Pamela, certain French blogs have sold out, revenue raising with an unedifying, shallow glamour which insults womens’ capacity for encompassing headier creative exploration & pursuit. Rosemary you are appreciated by the male / female readership, expand what you already offer, as you wish. We want to know what fulfills you wherever you live & travel. Thank you for presenting as an Australian woman abroad, with warmth & the intelligence of an insightful mind. Thank you for all the lovely things in your comment. It is very reassuring to know that what I am writing is appreciated. Although, as Susan says, we blog for ourselves, we still like to know that what we’re writing is useful to our readers. And, as I replied to Pamela, I agree entirely about the revenue-raising. 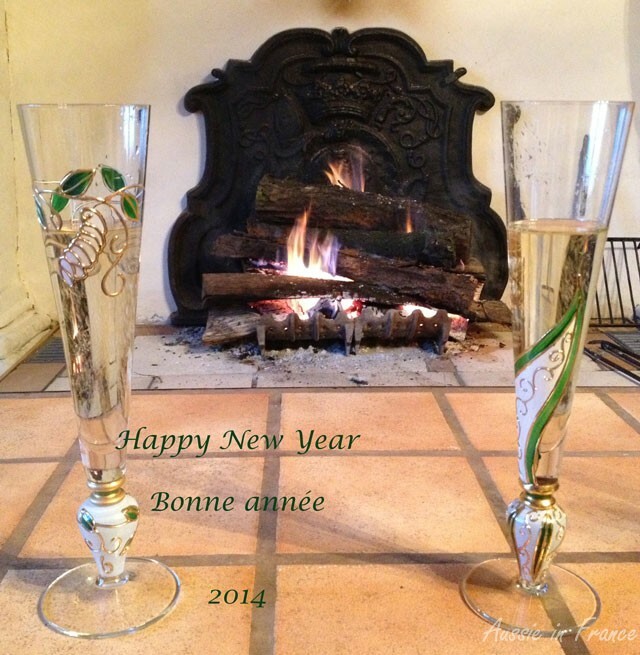 I wish you an excellent 2014! For me Friday’s French and the Blogger Round-up is the most use. I think a post every couple of days is fine. I think you have to write about what interests you. The more you write a blog the easier it becomes, although you do have to be careful not to do things just because they are blog worthy. Your topics and focus change over time. Mostly blogs are for the person writing them, but it is worth remembering who your readers are so you can write to their level and tastes. Mind you, I’m always surprised what the popular posts are — often not posts I thought would engage people, whilst something I’ve put hours of effort into gets nary a comment. Susan, I read something recently which explains why a post you put hours of effort into gets no comments. If there is nothing left to say because you’ve covered the topic completely, people don’t feel the need to comment, whereas if they feel they can contribute intelligently, they are more likely to say something! Cela m’amuse de voir la France commentée par un regard un peu extérieur. Bonjour Brigitte et bonne année à vous aussi! I hope that your English will progress! Thank you for reading the blog and commenting. I am new to your blog but can tell right away that I will enjoy coming here. I like your posts about life in Paris and Blois (and your Australian take on those), those about restaurants and exhibitions, I like Friday’s French – and I love your travel posts. I try not to click on too many of the blogger round-up posts, because I don’t want to get drawn into reading even more blogs… 🙂 How I found you? I think our colleague (and also ancienne de l’ESIT) Anja M.-B. linked to one of your posts in a reply to one of my Facebook posts, maybe a year ago. I was curious and when I realised who you were and that I had read your name several times in an ESIT context, I got even more interested. BTW I’m in Paris next week, if you want to meet for coffee…? Hi Pat and thank you for your feedback. Unfortunately we won’t be back in Paris until 12th January by which time I guess you will be back in Toulouse. What a pity! I hope we get to meet up another time.